Editors: Oecumenius andrew of Caesarea and Weinrich, William C., et.al. William Weinrich renders a particular service to readers interested in ancient commentary on the Apocalypse. 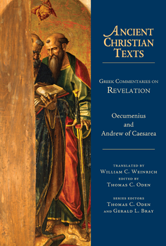 He translates in one volume the only two major commentaries on Revelation to come out of the Greek traditionthe early sixth-century commentaries of Oecumenius and Andrew of Caesarea.